You've mastered hiragana, pounding it into your brain with mnemonics methods and hiragana charts. Now it's time to move on to the other Japanese syllabary: katakana. 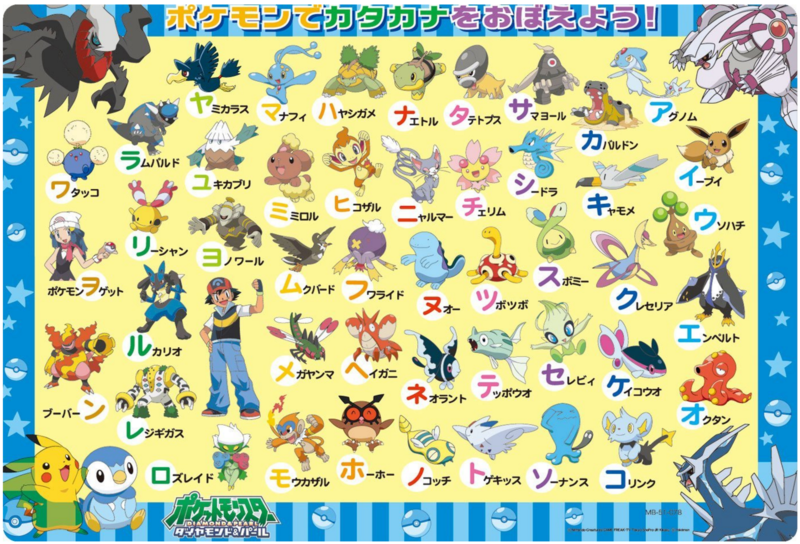 If you've got a Japanese teacher, they'll probably suggest using a katakana chart. This is a fine method, but the problem is, there are so many styles and types out there. 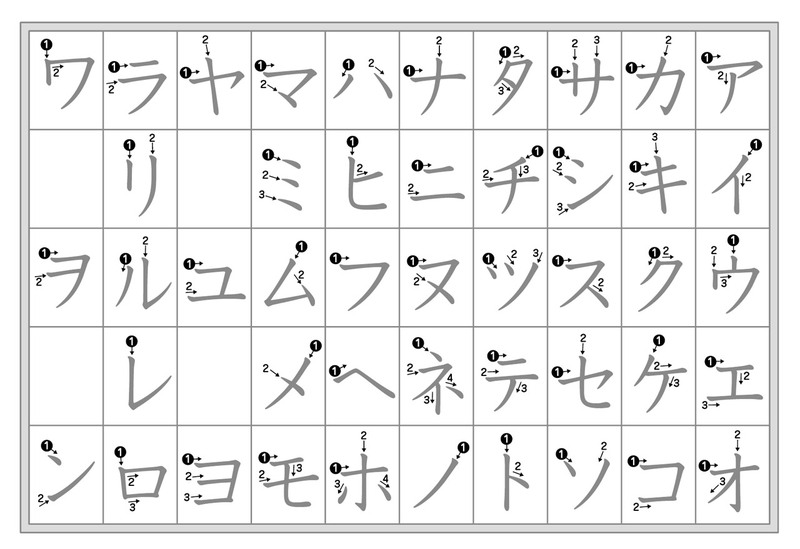 You have to find the katakana chart that fits your learning style. There are so many styles and types out there. 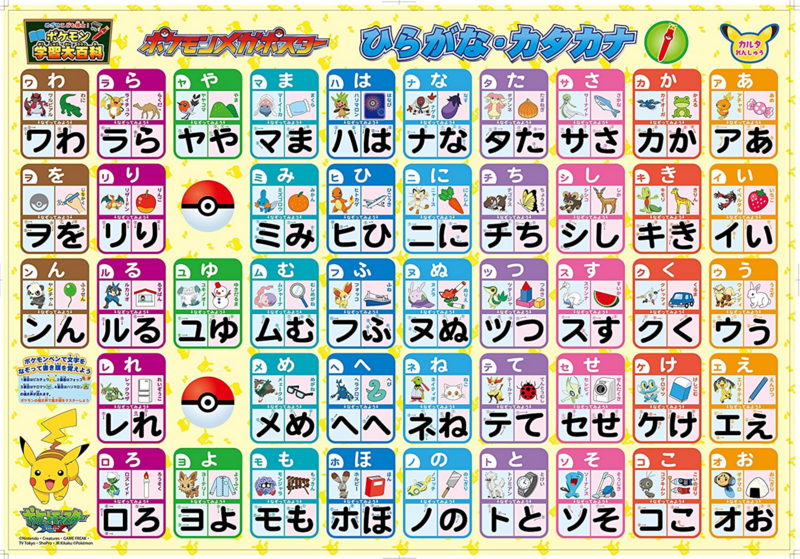 You have to find the katakana chart that fits your learning style. 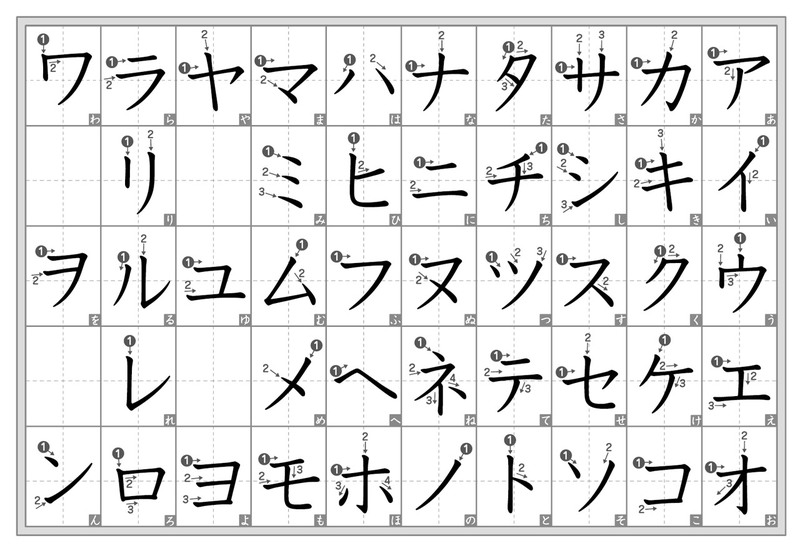 That's why we gathered 27 of the very best katakana charts all in one place. It's hard work tracking down Japanese learning materials, so thank your lucky stars we did it for you. Compare the charts below and choose the one that's right for you. Or print them all out and cover your bathroom wall (you know, for toilet study time). 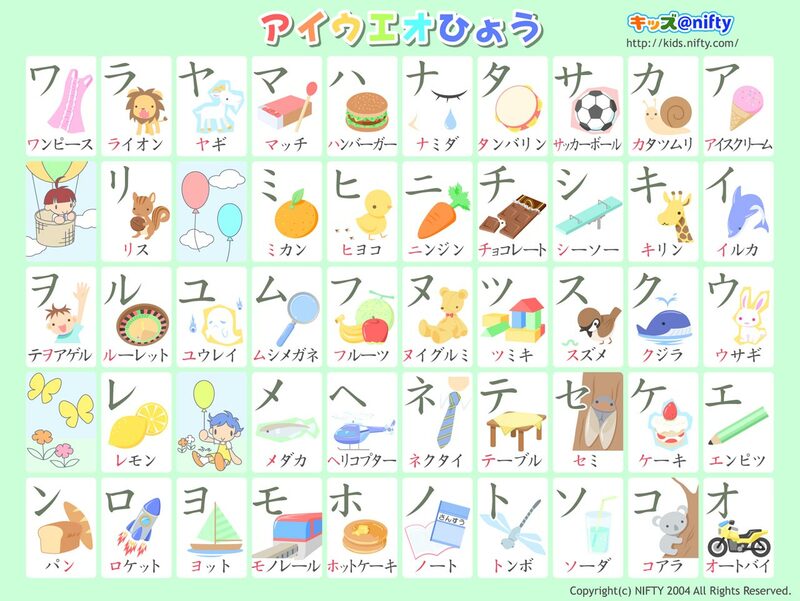 Scroll on to katakana mastery. 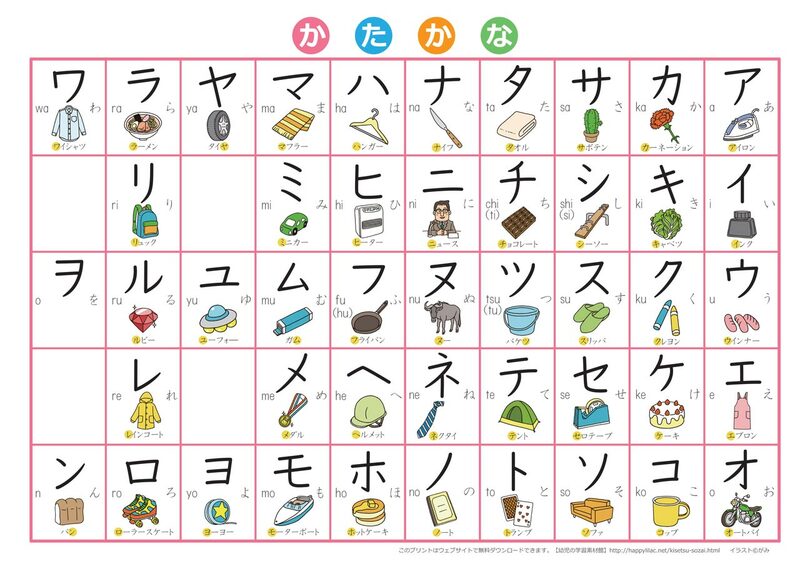 These are the kinds of katakana charts most Japanese learners will use. They're simple and boring, but they're functional and that's all you really need. Also, they're not gonna burn through all those fancy printer ink cartridges your dad just bought. 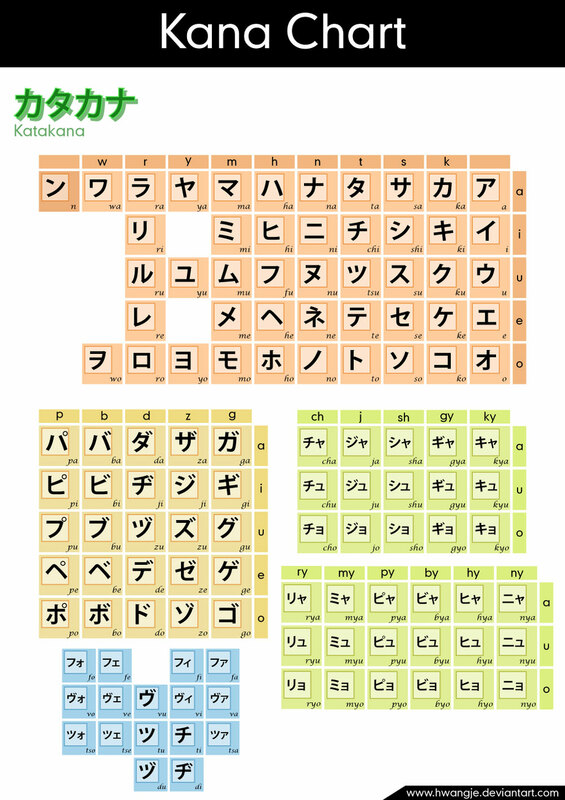 The first chart on the list is Tofugu's Own™ homegrown katakana chart. This is the same one we use on our Learn Katakana page (which you should check out if you want to learn katakana faster than everyone else). 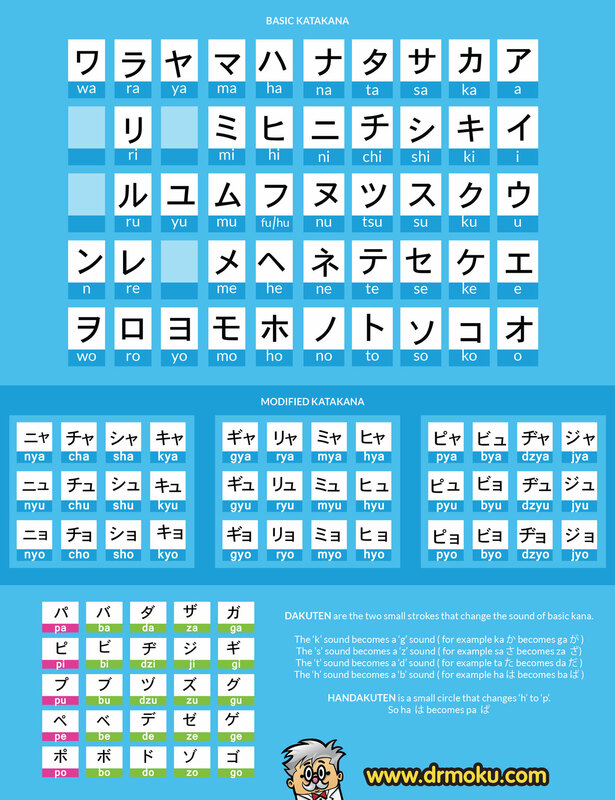 It's basic, as are all the charts in this section, but it contains the main kana and the dakuten/combo kana all on one handy sheet, so you can get a full katakana chart all on one sheet of printer paper. Nothing fancy, but then again, we prefer the simple things here at Tofugu anyway. Click the image to download the full size version. Same rule goes for the other charts in this list (click for full size). Dr. Moku teaches katakana using mnemonics just like we do. I recommend it if our katakana mnemonic method isn't your cup of tea, but you still want something similar in another form. 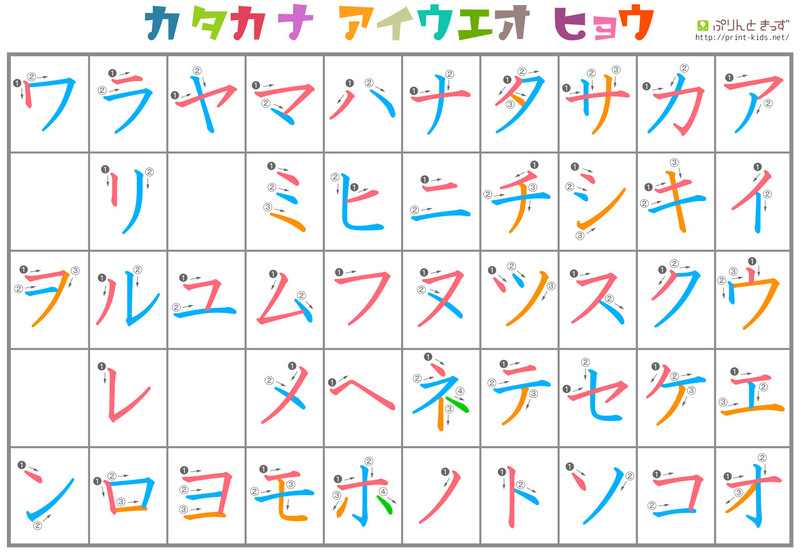 They also made a katakana chart and it's fine. No mnemonics on this one though (remember, this is the "standard" section of the list). But you'll probably find it helpful. You can also download the chart from the original source. And check out everything else Dr. Moku makes too. There's quite a bit there for Japanese learners. You may know DeviantArt as the place you go to find pictures of Sonic the Hedgehog sitting on a toilet, but there's more than just upsetting fan art on this website. 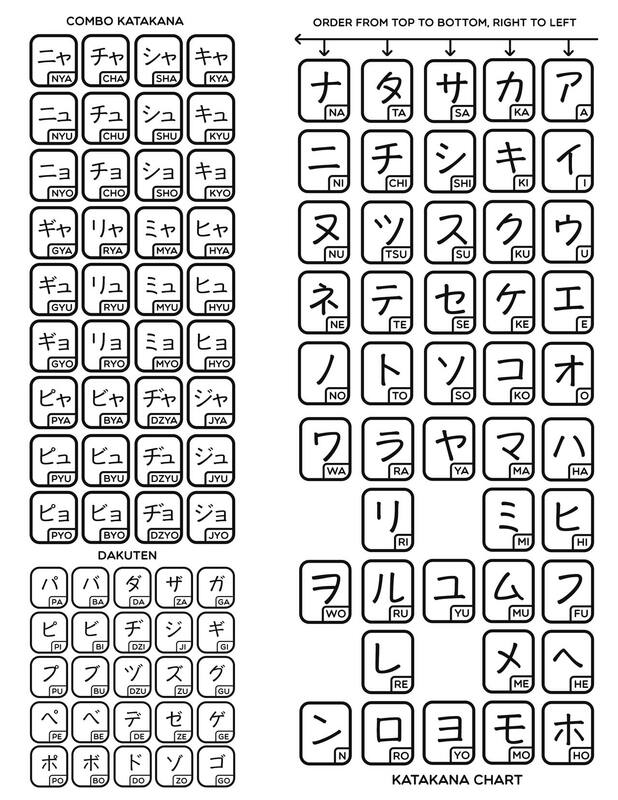 There's also this katakana chart, made by hwangje. Color coding the subsections of the chart is a nice touch, and we like the row/column setup too. It's another fine chart, in case the others aren't quite your style. You can also download this chart on DeviantArt. Just don't tell your mom we told you about this website. Mnemonics is one of the very best ways to memorize, well, just about anything. Now we get to the good stuff: mnemonics. Mnemonics is one of the very best ways to memorize, well, just about anything. That's why Tofugu is always adding mnemonics to the Japanese resources we make, including our learn katakana page. Other smart people have caught on to this technique too, and as a result there are a few katakana mnemonics charts floating around out there. Grab the one that works for you and learn faster than everyone else. 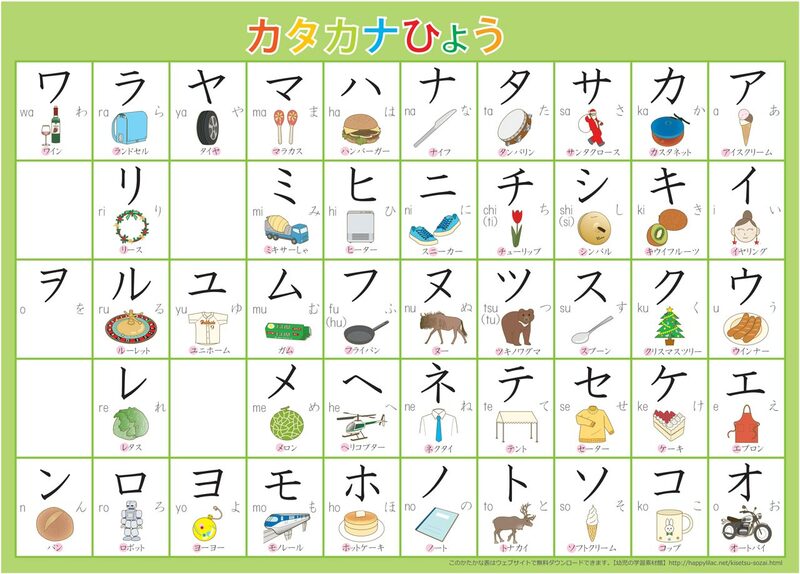 Our katakana learning method is all about them sweet, sweet mnemonics, so it's only natural we make a chart using them too. 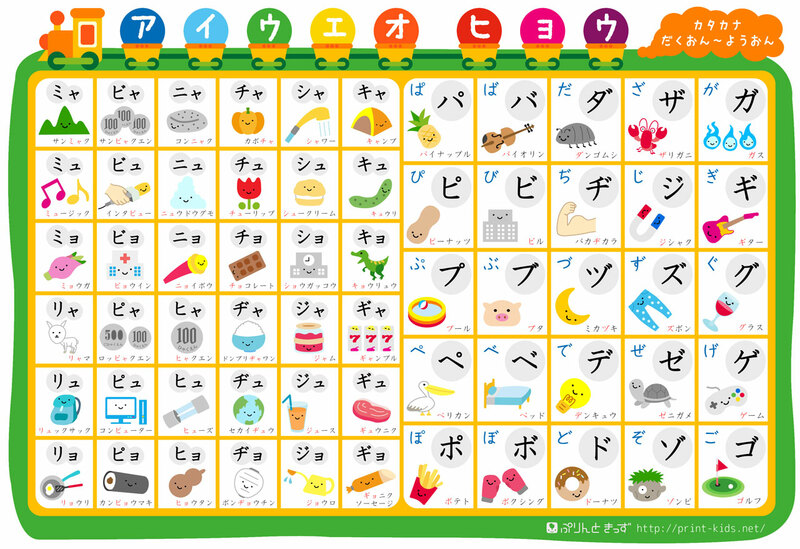 If you're studying with our learn katakana page, then I recommend you use this chart to reinforce that learning. Click the image to download. Study with mnemonics for a little while and you won't need any of these charts ever again. This is an old mnemonics chart by Dr. Kazumi Hatasa. The image quality is a little crummy because it's old, but mnemonics don't need to be 4K-HD-Retina-Displayed to work. If you're feeling the groove of these memory helpers, download the chart by clicking the image below. Or you can download the chart from its original source at UNC Wilmington. They've got nice beaches there. 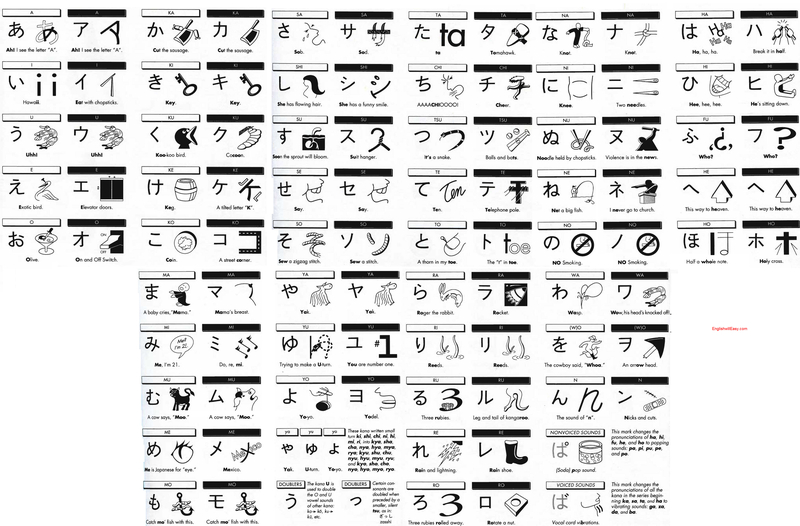 Kanji Pict-O-Grafix is a 1992 book by Michael Rowley that turns kanji into pictograms. He went one step further for kana and made picture mnemonics. 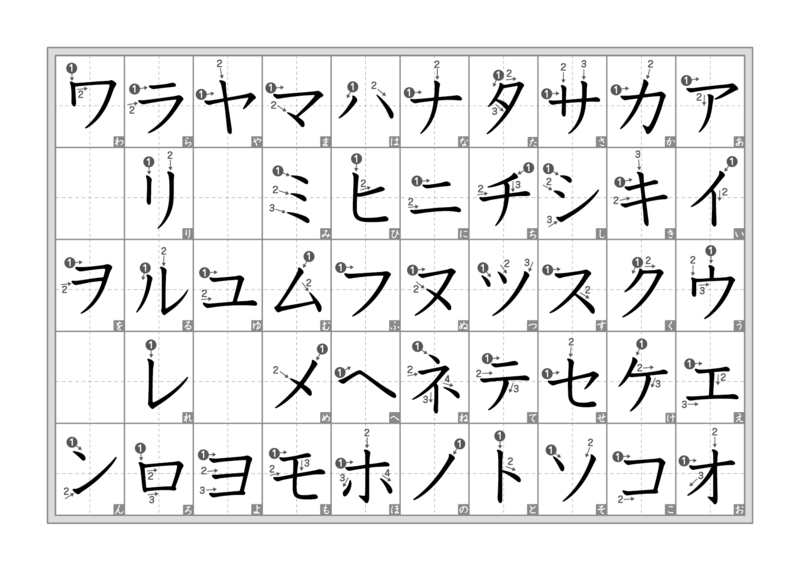 The hiragana-only version of this chart is featured in our post 27 Hiragana Charts: Stroke Order, Practice, Mnemonics, and More. Download this sweet baby by clicking the image above or go to the original source. Learning to read katakana is great, but you should learn how to write it too. And if you want to write katakana without making it look wonky, you need to learn stroke order. Kanji stroke order follows a small set of rules you can use for every kanji ever. For kana though, you have to learn how write each one individually. Don't cry though, there are only 46 to learn. This chart by Happy Lilac is so basic, it almost fits in the "standard" section above. But it shows the katakana stroke order, so it's worth checking out if you need a simple reference to help you learn how to write. Download by clicking the image above or by downloading at the Happy Lilac site. Wikipedia is a great place to learn almost anything, like how Napoleon died or how to properly write the katakana ム. This is a seriously simple chart made by a user named Pmx. It's really printer-friendly too, so don't be afraid to print off a few of these and stuff them in your pants pockets. Download by clicking the image above, or by going to Wikipedia. Just don't blame us if you accidentally end up reading about bird evolution for three hours. Finally, a stroke order chart with pizazz! And the best part: there's nine different versions of this chart, all in different colors and styles. So if you don't really like the one we chose here, check out the source page and choose the one that's right for you. Stroke order alone will enable you to write katakana fine enough. But mixing quadrant boxes with stroke order really helps you envision what goes where. That's why we included these simple charts from Ame no Zenyori Sasanozen. 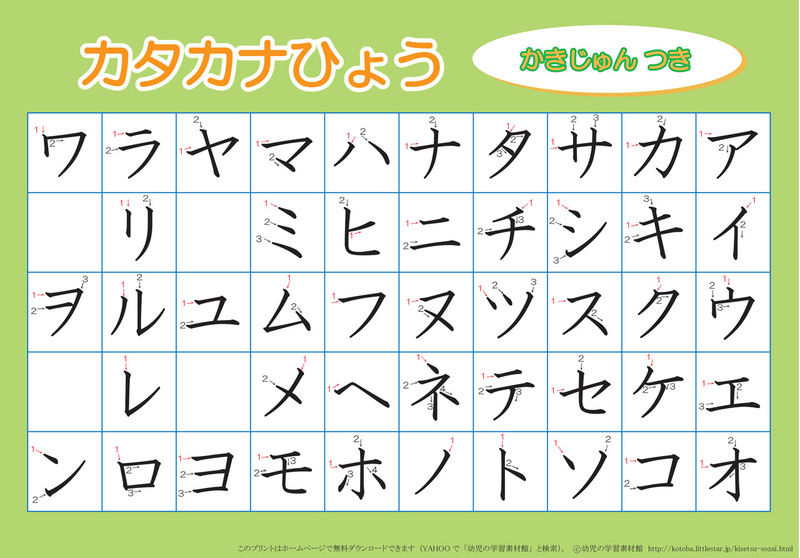 Print them out and trace the lines so your hand can learn where it needs to go when writing katakana. Pay attention to what quadrant each piece of the kana character falls in. Use these before moving on to the "practice charts" section below, and you'll have a much easier time. Download by clicking the images above or harvest straight from the source. 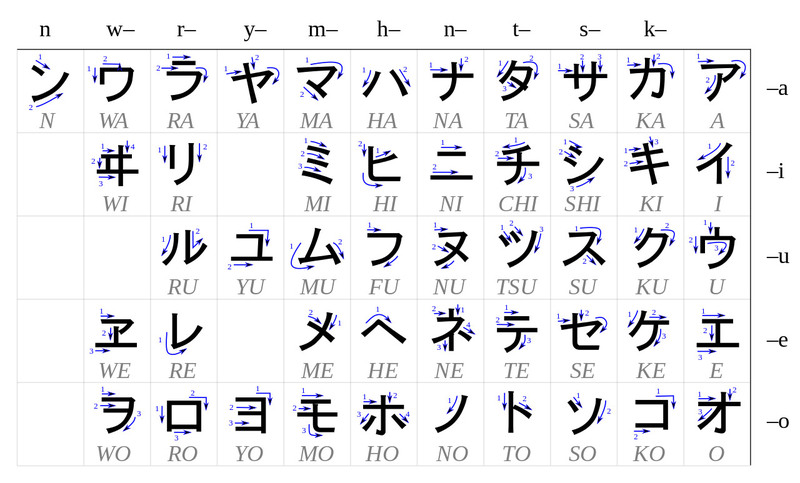 Stroke order charts show you how to write katakana, but they don't really help you actually write it. That's why you need something that makes you interact with the material, and these charts do just that. Though you could argue these aren't exactly "charts," we say stop splitting hairs and start studying. PrintKids has other entries on this list, but for the practice section they have quite a few in two different varieties. The first variety is anaume 穴埋め（あなう　） (filling in blanks). 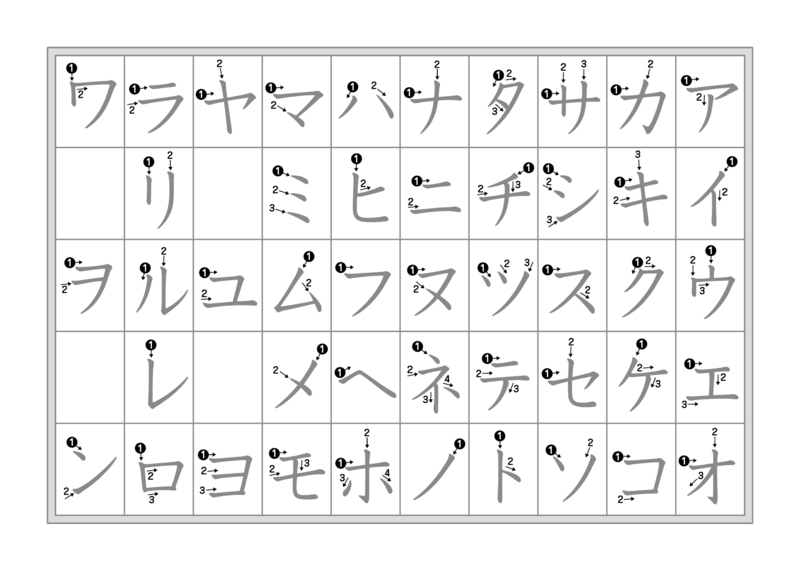 These charts make you write the katakana that logically falls in place on the chart. This should be easy if you've studied your katakana charts well. If not, maybe go back and learn with some of the standard charts before working on these. 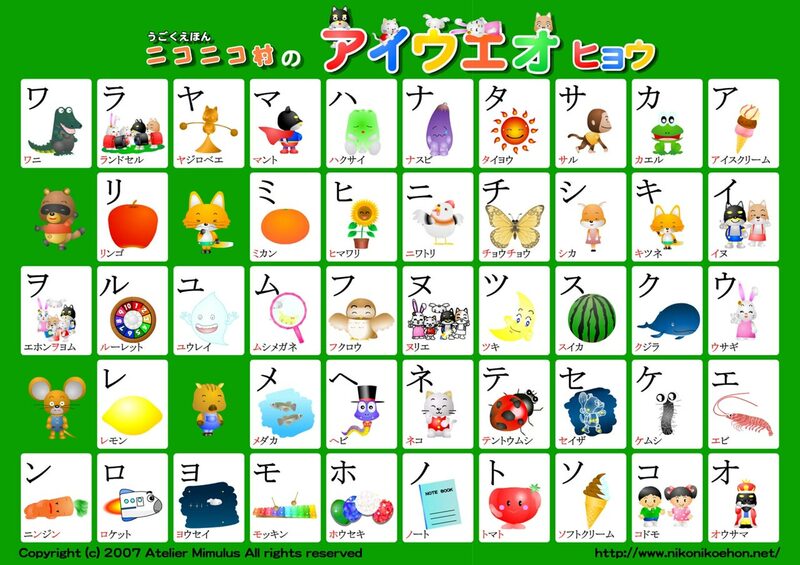 Click the image to visit the PrintKids page and get all the 穴埋め katakana practice you can handle. The second variety is the more run-of-the-mill (but still very useful) writing practice. 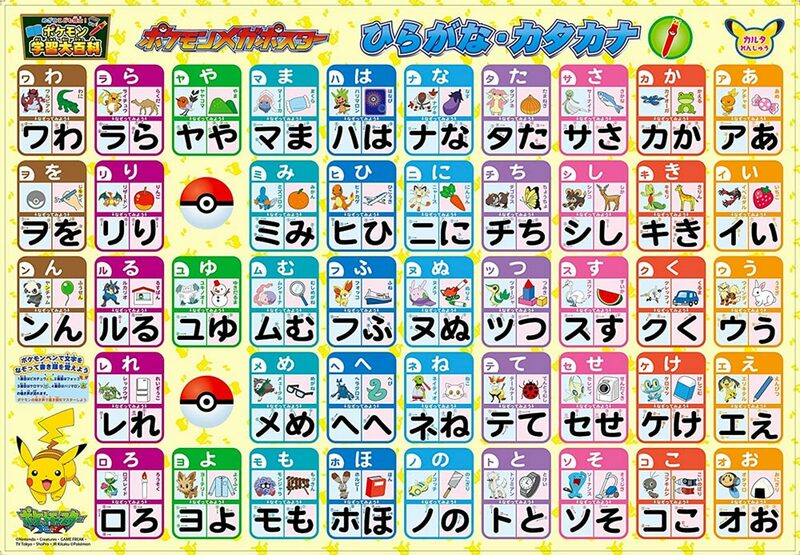 Click the images to download the katakana chart pdf of your choice, or go to the PrintKids site and scroll all the way down to the bottom. 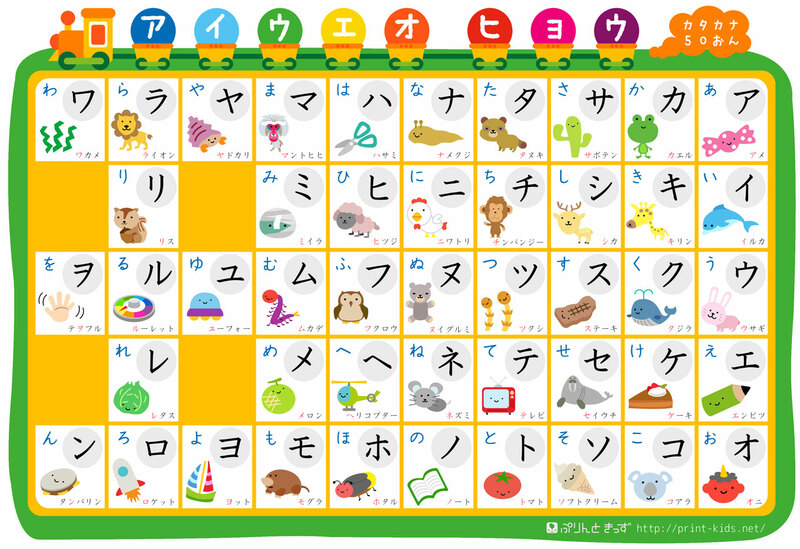 These 31 charts from Nifty Kids are the best katakana writing practice on this list. They're easier to print, offer more ways to practice on each page, and look classier overall than some of the other kids charts we've seen. Click the image above to see all your options or go straight to the Nifty Kids page. You can probably guess that Japan has more kids studying katakana than it does adults. 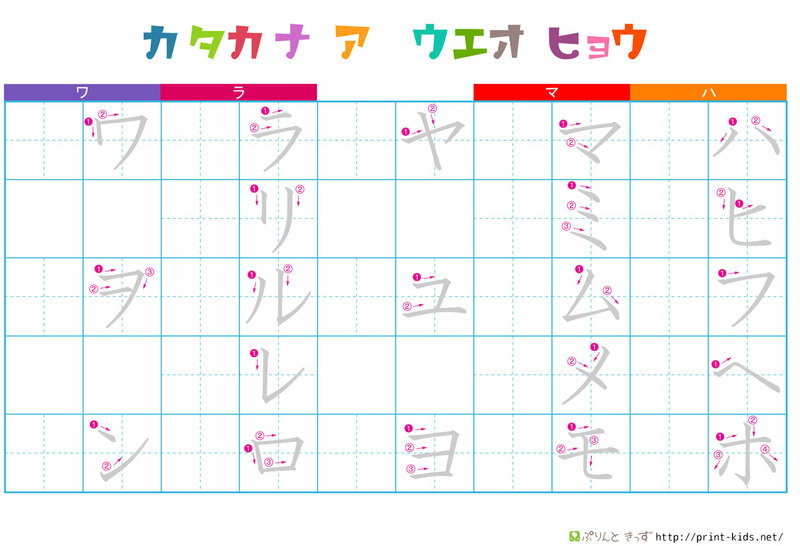 So naturally, most katakana charts are made for babies. That doesn't mean you can't use them though. If you have kids, or just like childish things, you'll get some use out of these charts. Happy Lilac is back, this time with nice picture charts. The drawings are simple, cute, and easy enough to print. Click either of the images to download, or go straight to the source. Now we're getting into kawaii territory. Nice muted pastels and cute pics. 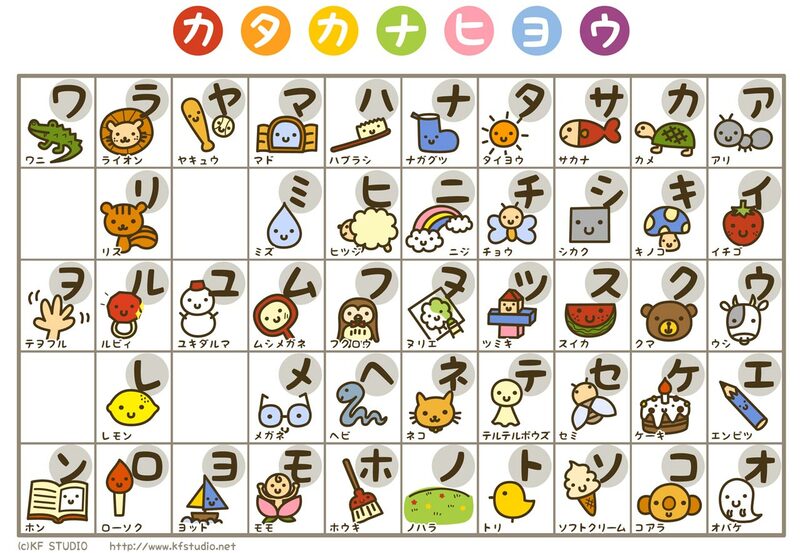 It probably won't help you learn katakana any better or worse, but it's quite cute. Download by clicking the image or travel all the way to Nifty Kids. Oh, snap! We buried the needle of the kawaii-meter on this one. 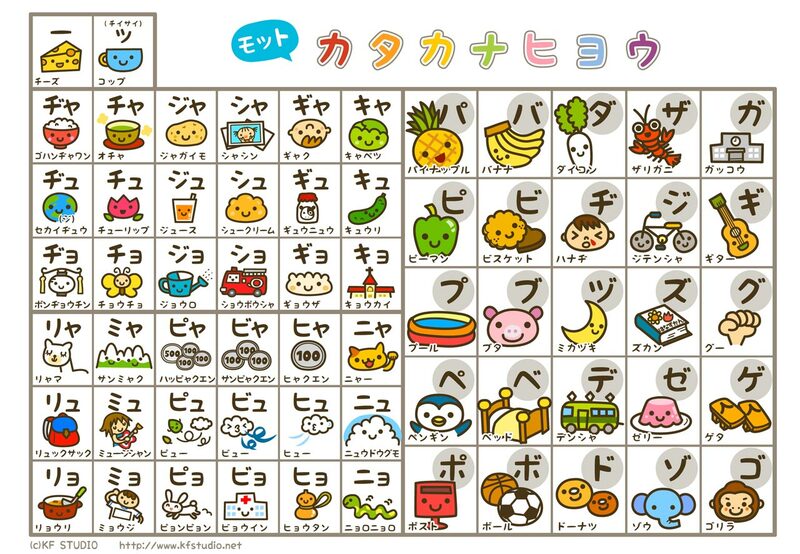 This is hands-down the cutest way to learn katakana. And there are so many different versions too. 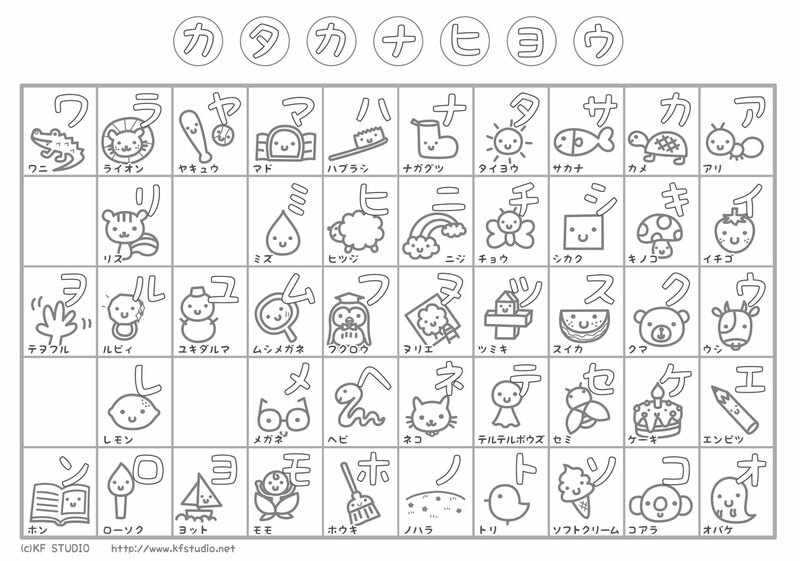 Now that I'm looking at it, PrintKids katakana charts are rather cute too. But cuter than KFStudio above? I don't know, I can't decide! Tell us which you think is cuter on Twitter. We're @tofugu! Mosey your cursor on up to that picture there and give a click to download this cuteness straight to your computer machine. Or head on over yonder to PrintKids. The picture of the ケムシ (caterpillar). Look at those eyes. The collection of neato vocabulary words you'll pick up studying this chart. ヤジロベエ (balancing toy), セイザ (constellation), ムシメガネ (magnifying glass). Most words are common animal words, but a few are a tad more interesting. Click to download or go to the source. Everybody loves Pokemon. So why not combine them with your katakana learning? 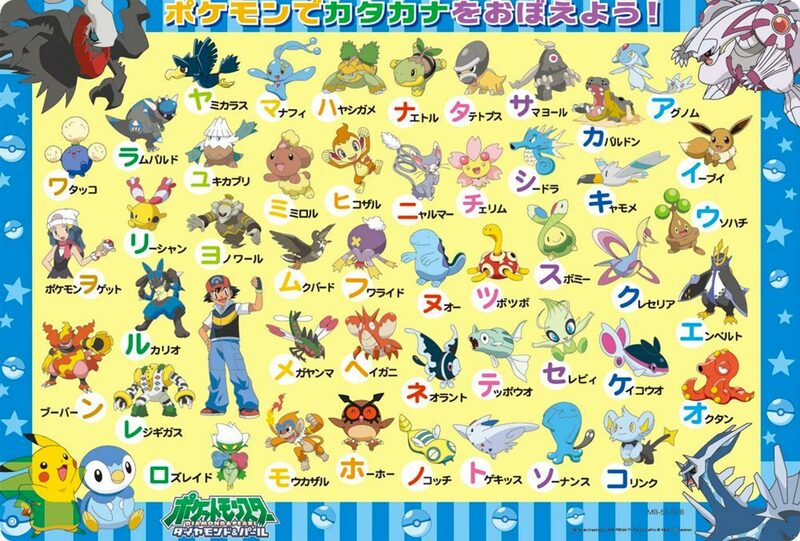 Finally, you can learn katakana and Japanese Pocket Monster names at the same time. What a deal! There are two charts to choose from. Click the respective versions to get a downloadable version. If you want to buy higher quality versions of either chart, check out this link or this link and buy them on Amazon. 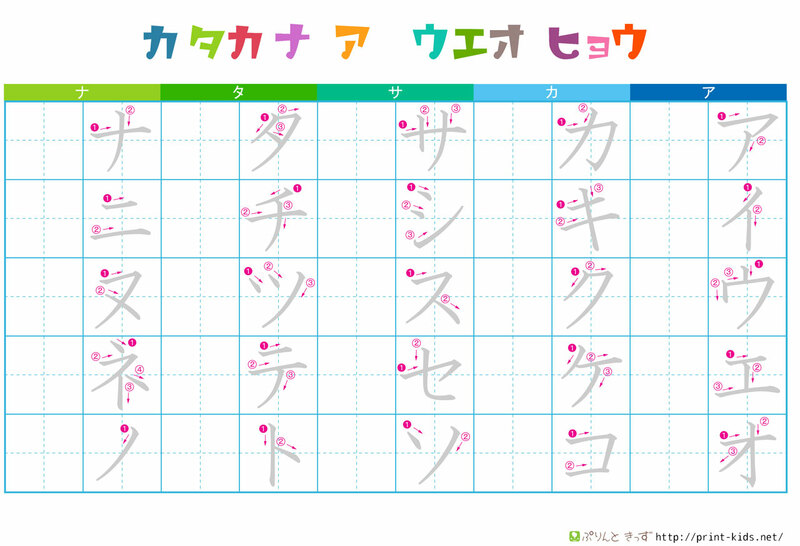 Katakana charts won't actually teach you the syllabary. That's why we created a method for learning katakana that teaches you in the shortest amount of time. Katakana charts are an okay way to study, but they won't actually teach you the syllabary. You have learn it (get it inside your head) and practice (recall and reproduce it from your head). That's why we created a method for learning katakana that does both these things in the shortest amount of time. 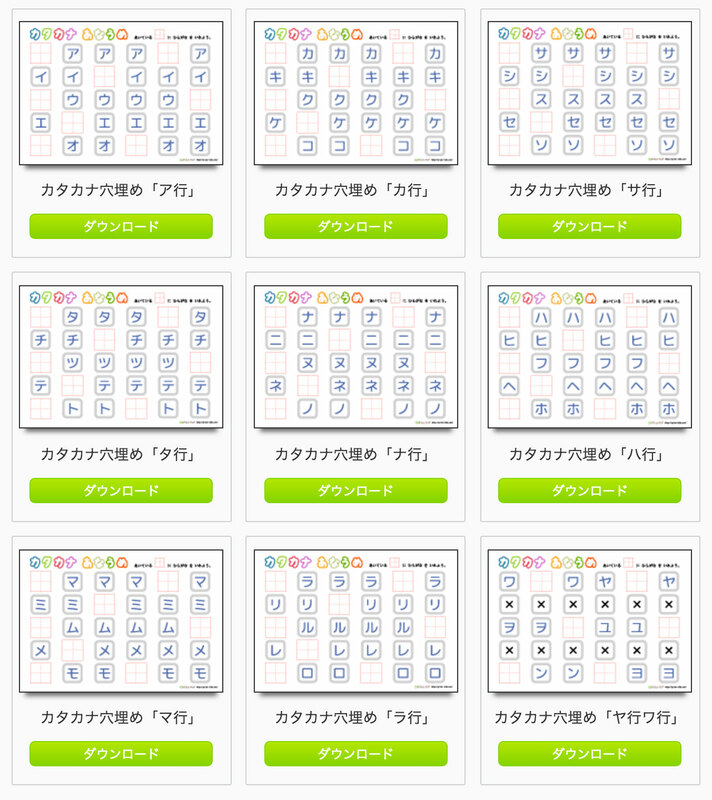 It's absolutely free and you'll be able to read every single katakana character by the time you're done. It won't take as long as you think either. I hope you found the katakana chart of your study dreams on this list. If not, try searching Google for Katakana Chart or カタカナ表. But don't spend too much time looking for charts. 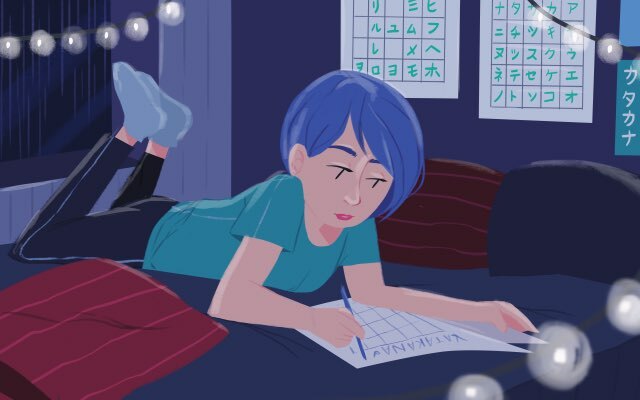 The sooner you actually start learning katakana, the sooner you can go learn kanji and other more important Japanese-related things.